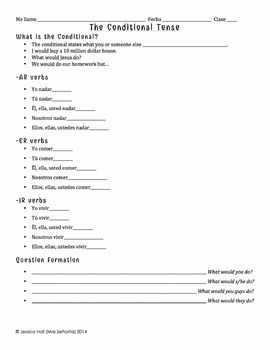 This zip file includes everything you need to teach a lesson on regular -AR, -ER, and -IR verbs in the conditional tense. 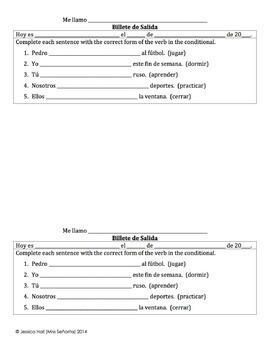 The powerpoint teaches what the conditional tense means, what the verb endings are for regular -AR, -ER, and -IR verbs, how questions are formed, and allows students to practice conjugating verbs in the conditional tense. The notes page has blanks in it for students to follow along with the powerpoint. This lesson is ideal for a Spanish 3 class in high school. 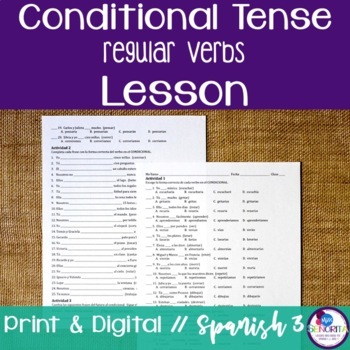 This lesson is included in my Spanish Conditional Tense Bundle.